Almost all Jews in Algeria left upon independence in 1962. Algeria's 140,000 Jews had French citizenship since 1870 (briefly revoked by Vichy France in 1940), and they mainly went to [France], with some going to Israel. Since 2000, there has been a large, consistent flow of Jews of Algerian origin leaving France for Israel. Professor Peter Schafer of the Freie University of Berlin has argued that antisemitism was first spread by "the Greek retelling of ancient Egyptian prejudices". In view of the anti-Jewish writings of the Egyptian priest Manetho, Schafer suggests that antisemitism may have emerged "in Egypt alone". According to the 1st century Jewish historian Flavius Josephus, Manetho, a Hellenistic Egyptian chronicler and priest, in his books on Egyptian history, alleges that in the 3rd century BCE, Moses was not a Jew, but an Egyptian renegade priest called Osarseph, and portrays the Exodus as the expulsion of a leper colony. Josephus argues that Manetho's claims are inconsistent. In 629 the Roman emperor Heraclius I. had driven the Jews from Jerusalem. This was followed by a massacre of Jews throughout the empire—in Egypt, aided by the Copts, who had old scores to settle with the Jews, dating from the Persian conquest of Alexandria at the time of Byzantine Emperor Anastasius I (502) and of the Persian general Shahin (617), when the Jews assisted the conquerors in fighting against the Christians. Under the Bahri dynasty (1250–1390), one of the Mamluk dynasties, the Jews led a comparatively quiet existence; though they had at times to contribute heavily toward the maintenance of the vast military equipment, and were harassed by the cadis and ulemas of these strict Muslims. Al-Maqrizi relates that the first great Mameluke, Sultan Baibars (Al-Malik al-Thahir (1260–77), doubled the tribute paid by the "ahl al-dhimmah." At one time he had resolved to burn all the Jews, a ditch having been dug for that purpose; but at the last moment he repented, and instead exacted a heavy tribute, during the collection of which many perished. In 1324 the Jews were accused of arson at Fostat and Cairo; they had to exculpate themselves by a payment of 50,000 gold pieces. Under the Burji Mamelukes the Franks again attacked Alexandria (1416), and the laws against the Jews were once more strictly enforced by Sheik al-Mu'ayyid (1412–21); by Ashraf Bars Bey (1422–38), because of a plague which decimated the population in 1438; by Al-Ẓahir Jaḳmaḳ (1438–53); and by Ḳa'iṭ-Bey (1468–95). The lastnamed is referred to by Obadiah of Bertinoro. The Jews of Cairo were compelled to pay 75,000 gold pieces. Egypt was once home of one of the most dynamic Jewish communities in their diaspora. Caliphs in the ninth-eleventh centuries CE exercised various repressive policies, culminating in the destruction and mass murder of the Jewish quarter in Cairo in 1012. Conditions varied between then and the advent of the Ottoman Empire in 1517, when they deteriorated again. There were at least six blood libel persecutions in cities between 1870 and 1892. In more recent times, the fraudulent Protocols of the Elders of Zion have been published and promoted as though they were authentic historical records, fueling antisemitic sentiments in Egyptian public opinion. 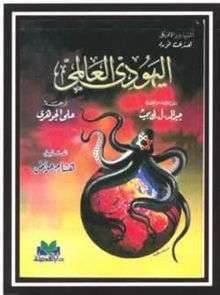 Also recently published in Egypt, has been Henry Ford's antisemitic treatise, The International Jew, with distinctly antisemitic imagery on the cover. The area now known as Libya was the home of one of the oldest Jewish communities in the world, dating back to at least 300 BCE. The Shoah (Hebrew word for catastrophe; genocide of the Jews during World War II): In the late 1930s, the pro-Nazi Fascist Italian regime began passing antisemitic laws. As a result of these laws, Jews were fired from government jobs, some were dismissed from government schools, and their citizenship papers were stamped with the words "Jewish race." Despite this repression, 25% of the population of Tripoli was still Jewish in 1941 and 44 synagogues were maintained in the city. In 1942, German troops fighting the Allies in North Africa occupied the Jewish quarter of Benghazi, plundering shops and deporting more than 2,000 Jews across the desert. Sent to work in labor camps, more than one-fifth of this group of Jews perished. In 1948, about 38,000 Jews lived there. The imposition of a French protectorate in 1912 alleviated much of the discrimination. Despite their current small numbers, Jews continue to play a notable role in Morocco; the king retains a Jewish senior adviser, André Azoulay, and Jewish schools and synagogues receive government subsidies. However, Jewish targets have sometimes been attacked (notably in Al-Qaeda's bombing of a Jewish community center in Casablanca, see Casablanca Attacks), and there is sporadic antisemitic rhetoric from radical Islamist groups. Late King Hassan II's invitations for Jews to return have not been taken up by the people who emigrated. The Shoah in French Tunisia. Tunisia, as the only Middle Eastern country under direct Nazi control during World War II, was also the site of racist antisemitic measures activities such as the yellow star, prison camps, deportations, and other persecution. India is home to several communities of Jews. Over the course of the twentieth century, several important Hindu leaders, scholars and politicians, such as Vinayak Damodar Savarkar, Sita Ram Goel, Arun Shourie and others have vocally condemned antisemitism and have expressed support for Israel and the Jewish right to self-determination. Antisemitism first came to India with the Portuguese Christian Missionaries in the 16th century. Christian antisemitism in India manifested itself through the Goa Inquisition that resulted in the depopulation of the Jews in Goa, and the persecution of South Indian Jews by the Portuguese in Kerala. During the Sassanid rule over Assyria (Assuristan) (225 to 634) both Assyrian Christians and Jews suffered occasional persecution, especially under Sassanian high-priest Kartir The first legal expression of Islam toward the Jews, Assyrian Christians, Mandeans and Zoroastrians after the conquests of the 630s were the poll-tax ("jizyah"), the tax upon real estate ("kharaj") was instituted. Like most Arab League states, Iraq forbade the emigration of its Jews for a few years after the 1948 war on the grounds that allowing them to go to Israel would strengthen that state. However, intense diplomatic pressure brought about a change of mind. At the same time, increasing government oppression of the Jews fueled by anti-Israeli sentiment, together with public expressions of antisemitism, created an atmosphere of fear and uncertainty. In March 1950, Iraq passed a law of one-year duration allowing Jews to emigrate on condition of relinquishing their Iraqi citizenship. Iraq apparently believed it would rid itself of those Jews it regarded as the most troublesome, especially the Zionists, but retain the wealthy minority who played an important part in the Iraqi economy. Israel mounted an operation called "Ezra and Nehemiah" to bring as many of the Iraqi Jews as possible to Israel, and sent agents to Iraq to urge the Jews to register for immigration as soon as possible. The initial rate of registration accelerated after a bomb injured three Jews at a café. Two months before the expiry of the law, by which time about 85,000 Jews had registered, a bomb at the Masuda Shemtov Synagogue killed three or five Jews and injured many. The law expired in March 1951, but was later extended after the Iraqi government froze the assets of departing Jews (including those already left). During the next few months, all but a few thousand of the remaining Jews registered for emigration, spurred on by a sequence of bombings that caused few casualties but had great psychological impact. In total, about 120,000 Jews left Iraq. Japan has no native Jewish population; therefore any anti-Semitism would seem to date from a point when it was introduced by western contact. Nazi ideology and propaganda left its influence on Japan during World War II, and the Protocols of the Elders of Zion were subsequently translated into Japanese. Today, antisemitism and belief in Jewish manipulation of Japan and the world remains despite the small size of the Jewish community in Japan. Books about Jewish conspiracies are best sellers. According to a 1988 survey, 8% of Japanese have read one of these books. During the nineteenth century the Jews of Damascus were several times made the victims of calumnies, the gravest being those of 1840 and 1860, in the reign of the sultan Abdülmecit I. That of 1840, commonly known as the Damascus affair, was an accusation of ritual murder brought against the Jews in connection with the death of Father Thomas. A Jewish barber was tortured until he "confessed"; two other Jews who were arrested died under torture, while a third converted to Islam to save his life. The second accusation brought against the Jews, in 1860, was that of having taken part in the massacre of the Christians by the Druze and the Muslims. Five hundred Muslims, who had been involved in the affair, were hanged by the grand vizier Fuad Pasha. Two hundred Jews were awaiting the same fate, in spite of their innocence, and the whole Jewish community had been fined 4,000,000 piastres. The condemned Jews were saved only by the official intervention of Fuad Pasha himself; that of the Prussian consul, Dr. Wetzstein; of Sir Moses Montefiore of London, and of the bankers Abraham Salomon Camondo of Constantinople and Shemaya Angel of Damascus. From that time to the end of the nineteenth century, several further blood accusations were brought against the Jews; these, however, never provoked any great excitement. Despite close economic and military ties to Israel, Turkey has experienced a recent surge in anti-Semitic literature, most notably the sale of Mein Kampf, the autobiography of Adolf Hitler, which has become a bestseller through the country. Sales of the similarly themed books The Protocols of the Elders of Zion and Henry Ford's The International Jew have also increased. In the same vein, the 2005 bestselling book Metal fırtına, which depicts a fictional war between Turkey and the United States, is described by the author, in an interview with Vatan, as helping people understand the realities behind Israel and the Jews, and would see how the Jews betrayed Turkey. Antisemitic sentiments have also been observed in the Turkish media, such as in the nationalist Ortadogu, where Selcuk Duzgun, in an article titled Here is the Real Jew stated: "We are surrounded. Wherever we look we see traitors. Wherever we turn we see impure, false converts. Whichever stone you turn over, there is a Jew under it. And we keep thinking to ourselves: Hitler did not do enough to these Jews." In the Milli Gazete, Turkish author Hakan Albayrak wrote an article accusing the Israeli Government of Genocide and stating Zionism itself constituted genocide. On 8 January the Islamist daily Yeni Şafak, published an article which alleged that the Israeli Government was attempting to set up farms in southeastern Turkey, and populate them with Russian and Ethiopian Jews whose integration into Israel they found difficult. In 2005, it was reported by journalists such as Ayhan Bilgin in Vakit, that the Mossad and Israel were responsible for planting mines which killed Turkish soldiers in southeast Turkey. Such claims have created a very negative atmosphere against Israelis and Turkish Jews. Antisemitism has also recently been observed in the publications Anadoluda Vakit and Yeniçağ. Several antisemitic conspiracy theories from Islamists and ultra-nationalists in Turkey have attempted to demonize Jews and Israel. These theories have been fed in part by Turkish Israeli arms modernization projects, agricultural projects in southeast Turkey connected to the South-East Anatolia Agricultural Irrigation Project, which employ Israeli experts; mutual visits of Turkish and Israeli officials; and the alleged role of the Mossad in northern Iraq (the Iraq war is highly unpopular in Turkey) making statements such as "The Mossad is the boss in Northern Iraq" have all nourished these theories. The common conspiracy theory that Jews, the supposed chosen people who consider themselves superior, are trying to take over the world by creating internal problems has also been cited by Turkish newspapers. The well-known Turkish novelist Orhan Pamuk, often criticized and accused of being a traitor due to his interpretation of certain events in Turkish history, has been criticized as being "the servant of Jews," and "a Jew-lover" by the ultra-nationalist newspaper Yeniçağ. In the mid-1600s, Peter Stuyvesant, the last Dutch Director-General of the colony of New Amsterdam, sought to bolster the position of the Dutch Reformed Church by trying to reduce religious competition from denominations such as Jews, Lutherans, Catholics and Quakers. He stated that the Jews were "deceitful", "very repugnant", and "hateful enemies and blasphemers of the name of Christ". He warned in a subsequent letter that in "giving them liberty we cannot (then) refuse the Lutherans and Papists". However, religious plurality was already a legal-cultural tradition in New Amsterdam and in the Netherlands. His superiors at the Dutch West India Company in Amsterdam overruled him in all matters of intolerance. In 1939 a Roper poll found that only thirty-nine percent of Americans felt that Jews should be treated like other people. Fifty-three percent believed that "Jews are different and should be restricted" and ten percent believed that Jews should be deported. Several surveys taken from 1940 to 1946 found that Jews were seen as a greater threat to the welfare of the United States than any other national, religious, or racial group. It has been estimated that 190,000 - 200,000 Jews could have been saved during the Second World War had it not been for bureaucratic obstacles to immigration deliberately created by Breckinridge Long and others. Some cults also support conspiracy theories regarding Jews as dominating and taking over the world. These cults are often vitriolic and severely anti-semitic. For instance, the Necedah Shrine Cult from the 1950s on to the mid-1980s, has Mary Ann Van Hoof receiving antisemitic "visions" from the Virgin Mary telling her that the Rothschilds, a prominent Jewish banking family, are "mongrel yids(Jews)" bent on dominating the entire world economy through international banking. 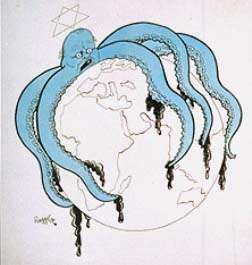 Most of the worlds problems, from poverty to world wars, are the cause of International Banking Jews and their "satanic secret society," according to Van Hoof. ↑ Schafer, Peter. Judeophobia, Harvard University Press, 1997, p 208. ↑ Examples of antisemitism in the Arab and Muslim world on intelligence.org.il, site of the Intelligence and Terrorism Information Center at the Center for Special Studies (C.S.S), Israel. Accessed 24 September 2006. ↑ Harris, 2001, pp. 149-150. 1 2 Morris, Benny. Righteous Victims: A History of the Zionist-Arab Conflict, 1881-2001. Vintage Books, 2001, pp. 10-11. ↑ For the events of Fez see Cohen, 1995, pp 180-182. On Marrekesh, see the Jewish Encyclopedia of 1906. 1 2 Gilbert, Martin. Dearest Auntie Fori. The Story of the Jewish People. HarperCollins, 2002, pp. 179-182. ↑ Milton, Shain (1994). The roots of antisemitism in South Africa. Johannesburg: Wiwatersrand University Press. pp. 9–18. 1 2 3 Larry Luxner, Life’s good for Jews of Bahrain—as long as they don’t visit Israel, JTA News, October 18, 2006. Accessed 25 October 2006. ↑ Sandeep Singh Grewal, Dr Munira Fakhro hopes for better future, WomenGateway, October 2006. Accessed 25 October 2006. ↑ Kowner, Rotem. "On Ignorance, Respect and Suspicion: Current Japanese Attitudes toward Jews". The Vidal Sassoon International Center for the Study of Antisemitism. The Hebrew University Of Jerusalem. Retrieved 23 December 2014. ↑ Daniel Pipes, Greater Syria: The History of an Ambition (New York: Oxford University Press, 1990) p. 57, records 75 victims of the Aleppo massacre. ↑ Levin, 2001, pp. 200-201. ↑ "A Year After Iraq War: Mistrust of America in Europe Even Higher, Muslim Anger Persists", Pew Global Attitudes Project, accessed March 12, 2006. ↑ "ADL Survey in 12 European Countries Finds Antisemitic Attitudes Still Strongly Held", Anti-Defamation League, 2005, accessed March 12, 2006. ↑ Flash Map of Attitudes Toward Jews in 12 European Countries (2005), Philo. Sophistry, accessed March 12, 2006. ↑ Smitha, Frank E. "Roosevelt and Approaching War: The Economy, Politics and Questions of War, 1937-38", accessed March 12, 2006. ↑ "Breckinridge Long (1881-1958)", Public Broadcasting Service (PBS), accessed March 12, 2006. 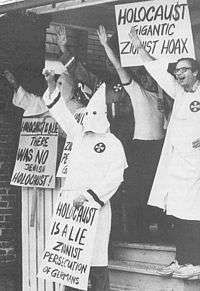 ↑ "Anti-Semitism and Prejudice in America: Highlights from an ADL Survey - November 1998", Anti-Defamation League, accessed March 12, 2006. ↑ Manuel Prutschi, "Anti-Semitism in Canada", Fall 2004. Accessed March 29, 2008. ↑ Dr. Karen Mock, "Hate Propaganda and Anti-Semitism: Canadian Realities", April 9, 1996. Accessed March 29, 2008. Wikimedia Commons has media related to Anti-Semitism.